Rahm: Resident? Maybe. Mayor? Likely : It's All Politics With the Illinois Supreme Court ruling that Rahm Emanuel has satisfied city residency laws, the major candidates for mayor of Chicago debated Thursday, just weeks ahead of the Feb. 22 election. 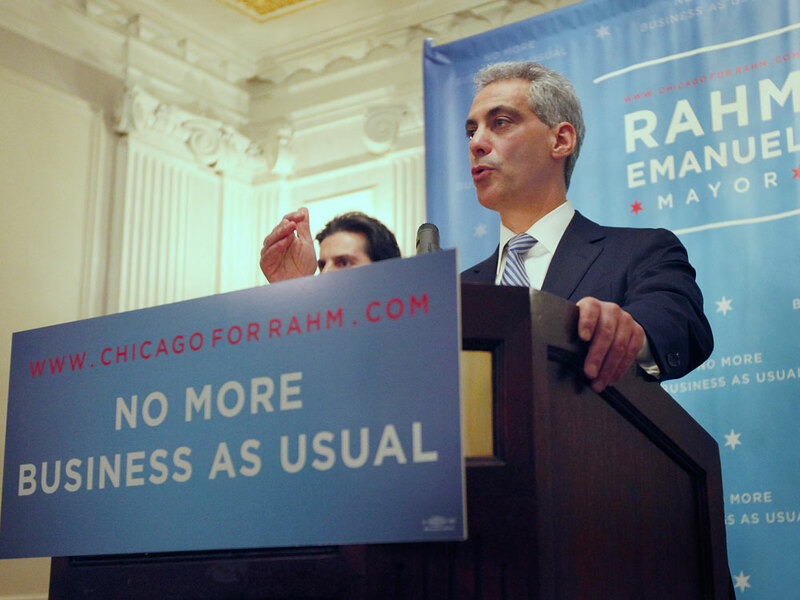 Rahm Emanuel, whose mayoral candidacy is no longer in doubt, holds a press conference on Dec. 2, 2010 in Chicago. The topsy-turvy world of Chicago politics has apparently been righted with yesterday's decision by the Illinois Supreme Court that Rahm Emanuel is qualified to run for mayor after all and thus should be on the ballot. It ended a hectic week that began on Monday, when a three-judge state appellate court panel ruled that Emanuel was not a resident of Chicago in the past year, a condition one must abide by if they want to run for mayor. On Tuesday, the state Supreme Court stayed the appellate order, ruling that Emanuel's name should remain on the ballot while it decided the merits of the case. Late Thursday afternoon, the court unanimously ruled that Emanuel qualified as a candidate. Emanuel, a former congressman from Chicago's North Side, quit the House in 2009 to become President Obama's chief of staff. In taking that job, he moved his family to Washington, renting out his Chicago home. When Mayor Richard M. Daley unexpectedly announced his retirement in September, Emanuel — who months earlier said in a TV interview that his life's ambition was always to be mayor of Chicago — jumped in the race. But the focus on his candidacy was more on whether he met the residency requirement and less on what he would do to solve the city's many woes. Emanuel argued that he always intended to return to Chicago, and in fact kept his wife's wedding dress stored in their Chicago home. The ruling means that the Feb. 22 election will go forward with Emanuel on the ballot. His campaign warchest dwarfs all of his opponents. A recent Chicago Tribune poll showed him with a huge lead over a field that included former U.S. Sen. Carol Moseley Braun, ex-Chicago Board of Education President Gery Chico and City Clerk Miguel del Valle — though not with a majority of the vote. If no one surpasses 50 percent, the top two candidates advance to an April 5 runoff. Common sense and the law had a meeting of the minds Thursday. Rahm Emanuel is back on the ballot for mayor. We believe the proper approach to election law in a democracy — and honestly, folks, that does include Chicago — is that legal interpretations should err on the side of inclusiveness. Thursday's decisive ruling was a victory for the voters, who deserve the right to decide for themselves who their next mayor will be. If Mr. Emanuel can run for mayor, Mr. Odelson said, what is to stop city workers from renting out their Chicago homes and secretly slipping off to the suburbs? "What's next?" he asked. "They leave an old pair of shoes in the basement, and that's enough?" Debate. Not long after the ruling, the candidates appeared in a debate sponsored by the Chicago Tribune and the City Club of Chicago. The Tribune's account of the debate said it "focused on ethics and taxes as candidates pitched themselves as the best option to satisfy voters who have grown weary of corruption scandals and paying more for city government." Braun, the nation's only African-American woman elected to the Senate and the consensus choice of the black establishment, was deemed the "aggressor:"
Braun used the debate to criticize Emanuel ... and Chico for having gone "from one government appointment to another" that helped them to profit as private citizens. "There's a difference to public service when it is for the benefit of the public versus public service when it inures to the benefit of your own private pocketbook," said Braun, who was awarded an ambassadorship to New Zealand by President Bill Clinton following her  re-election loss for the Senate. "Quite frankly that is a bright line distinction in this race — how you see public service, whether it's something to profit from personally, for yourself and your friends and your family, or whether or not it's something that you hold in trust to the public as a whole," she said. Chico said, "There never has there been a suggestion that I did everything but pursue the public interest in each of those jobs." He talked about the problem with the city's finances and said that "budget cuts alone would not resolve the problem." "We've added pay-to-influence — influence the decisions that are going to be made at City Hall. ... If (voters) want a mayor beholden to special interests and big money, I'm not their guy," del Valle said. Braun defended her ability to handle the city's finances despite the troubled finances of her organic food company and being late paying property taxes on her Hyde Park home five of the last six times. "I was creating jobs in the inner city with an organic triple-bottom-line company at the height of the recession," she said. During the debate, she told the audience about being shot at on 87th street, her staff holding her down on the floor of her car as they drove away. Skeptical, the present media asked her to describe the event. She hesitated before being asked what the intersection was and if it took place in broad daylight. She stammered that it was during the day, and her staff piped in to try and describe the scene and the intersection before someone asked her another question and moved the presser on from the odd claim that she had been shot at. NPR's David Schaper has been covering the Rahm saga from the outset. His last piece, which aired earlier today on Morning Edition, can be heard here.